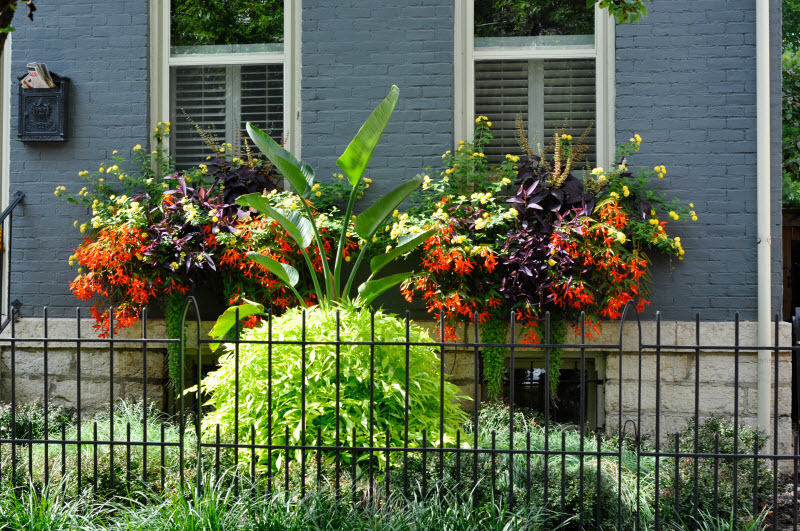 I am an advocate container and seasonal color for the ability to change your homes’ mood from season to season and introduce elements that provide a twist to the story of your landscape. 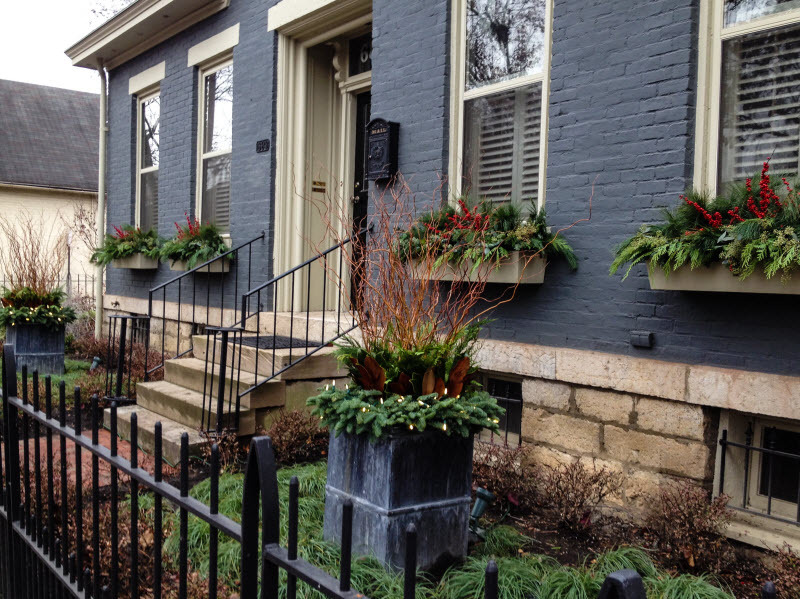 This home in historical German Village is a great showcase how seasonal color can provide serious (and noncommittal) impact. The front yard space is about 7 feet deep and is planted with low, monochromatic and textural plantings. 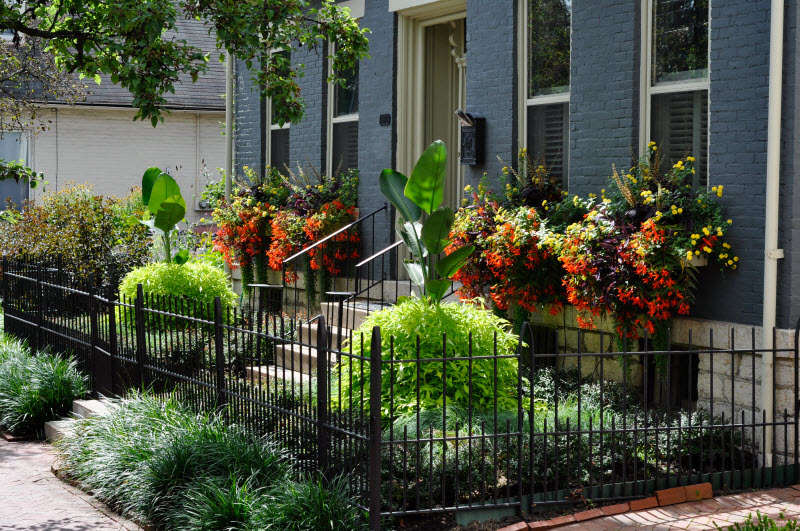 This was done intentionally to place the focus the window boxes and containers which are replanted four times a year with annuals and perennials. This frequent change allows us to change the mood and tones of the garden with the seasons and homeowners’ humor. Our color expert, Steve, and I created the combo for the windows to showcase an explosion of color. 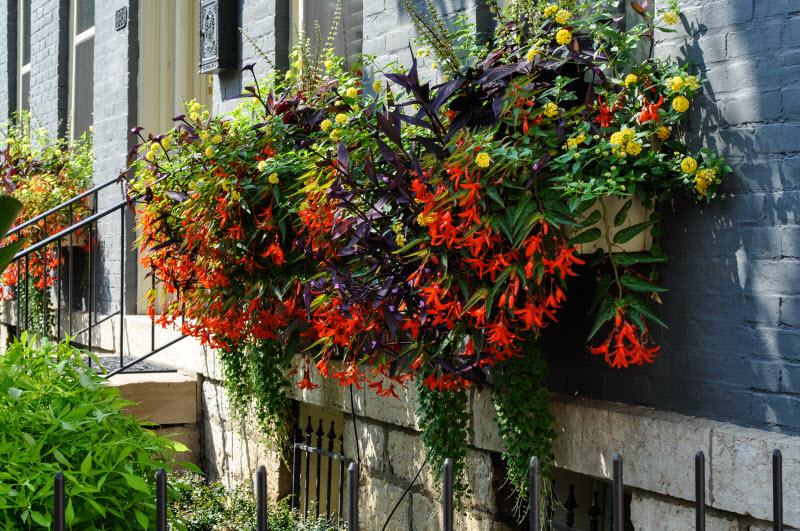 As you look at the house the two window boxes flank a central planter that is plant with Sterlitzia nicolai and Ipomea ‘Illusion Emerald Lace’. The containers were kept simple with just two species because the window boxes behind were the real show in this case. 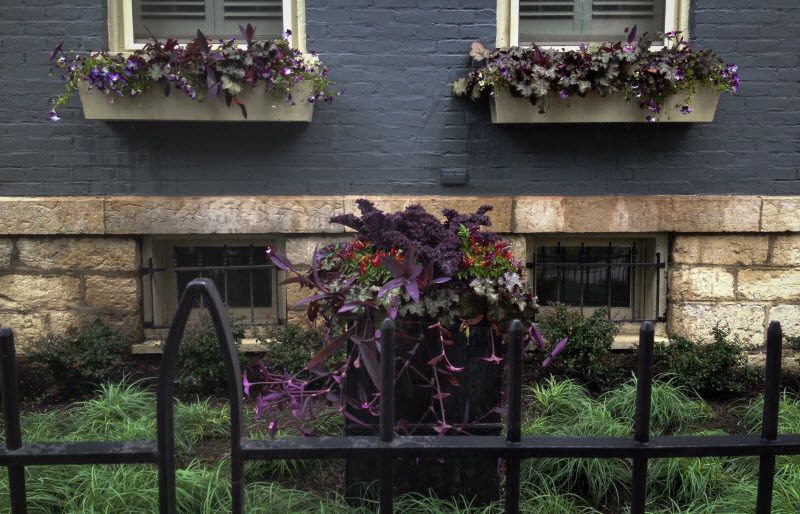 As we moved into fall the planters were planted in a monochromatic scheme of blue and purples. Redbor Kale (Brassica oleracea ‘Redbor’ and Medusa Ornamental Pepper (Capsicum annuum) were used alongside pansies to add some fall flair. 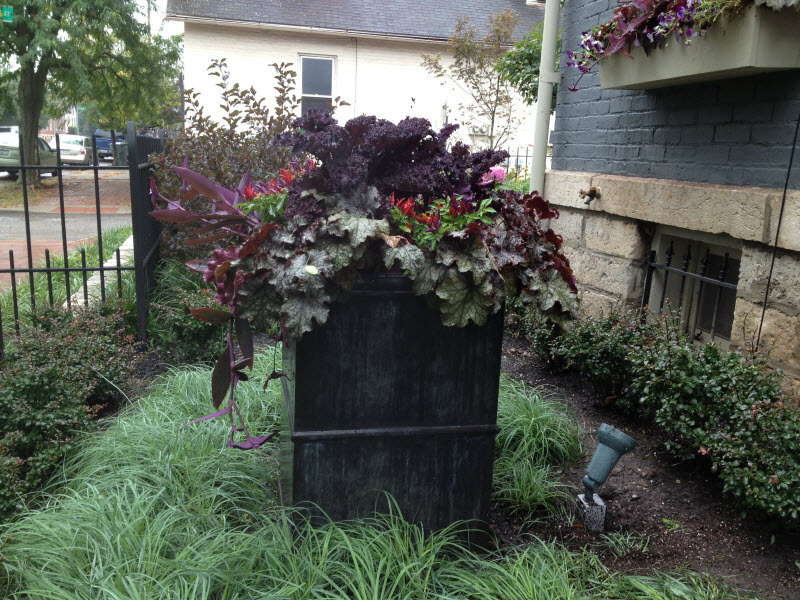 Adding Winter containers are normally the most appreciated in Ohio when most landscapes are brown, grey and dull green. Adding lights and hits of color always brings a welcomig impact that can stay long past the traditional Christmas decorations. The planters are filled with a Fraser Fir greenery, Southern Magnolia, Leyland cypress and scarlet curly willow. 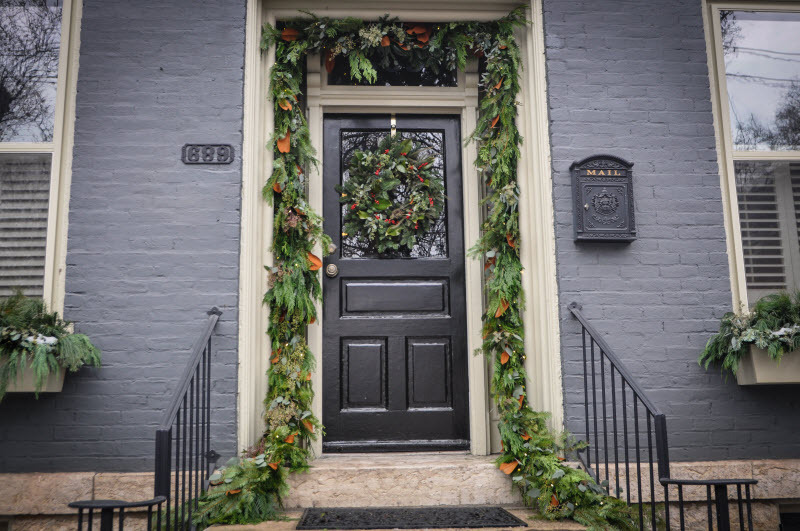 Looking at the front door we also draped the entry with a lush garland to welcome holiday guests and passersby. The garland and wreath at the front and embellished with eucalyptus, magnolia and Leyland cypress to tie in with the window boxes and planters. This entry was posted in Advice, C O N T A I N E R S, Central Ohio, G A R D E N S, gardening, Gardens, Inspiration, Landscape Design, McCullough, My Work, Ohio and tagged annuals, Begonia bolivensis ‘Waterfall Encanto Orange’, central ohio, Coleus ‘Dark Chocolate, Columbus, Dichondra argentea ‘Emerald Falls’, entry way containers, garden design, garland, German Village, landscape decorating, landscape design, Lantana ‘Luscious Lemonade, Setcreasea pallida ‘Purple Heart’, Southern Magnolia by Nick. Bookmark the permalink.